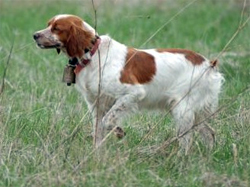 Many breeders differentiate between the American Brittany and the French Brittany breeds of hunting dog. Both are excellent upland bird hunting dogs, and the typical temperament is good-natured and outgoing. The breed loves to spend time with people as much as it loves working in the field. Generally recognized as sub sets of the same breed, there are recognizable differences between these two breeds of spaniels. 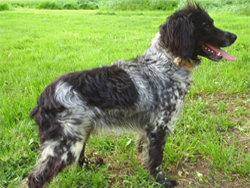 The American Brittany is taller and faster, while the French Brittany appears more spaniel-like. The Epagneul Breton is totally of French origin and a pure product of the early French foundation breed stock dating back to 1907 and beyond. In contrast, the American Brittany dog is a more recent American creation developed in the United States subsequent to World War 1 by American dog breeders who chose to move away from the original style of the Epagneul Breton. Additional breed information for the French Brittany Spaniel can be found at the French Brittany Gun Dog Association website.